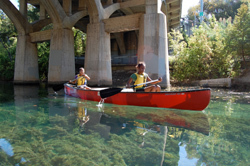 Lady Bird Lake provides a tremendous recreational resource for the state�s capitol, including hike and bike trails surrounding the shoreline as well as paddling, rowing, and fishing in the lake. 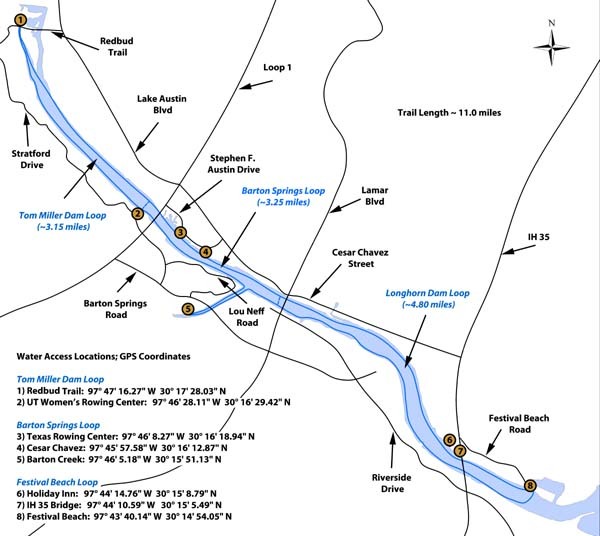 Lady Bird Lake (formerly Town Lake) is the easternmost of a chain of reservoirs on the Colorado River. The reservoir was formed in 1960 by the construction of Longhorn Dam at its eastern boundary by the City of Austin. The western end of the lake is bounded by Tom Miller Dam, built in 1939. The reservoir was envisioned from the beginning as a recreational venue for the city. A system of hike and bike trails was built along the shoreline of the lake in the 1970s, establishing what was then known as Town Lake as a major recreational attraction for the city of Austin. 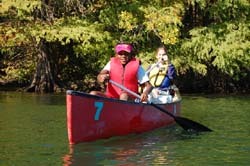 On July 26, 2007, the Austin City Council passed a resolution authorizing the renaming of the reservoir from Town Lake to Lady Bird Lake in honor of Lady Bird Johnson, the former First Lady of the United States and a long-time resident of the Austin area who had died earlier that month. In renaming the lake, the City Council recognized Johnson for her dedication to beautifying the lake and her efforts to create a recreational trail system around the lake's shoreline. Plastic worms, jigs and spinnerbaits are popular choices for largemouth bass. Light spinning or fly fishing tackle is recommended for large redbreast and redear sunfish. Large common carp, including many fish in the 20-30 pound range, are frequently caught. An abundance of birds, fish, and plants can be seen in and around Lady Bird Lake. Beautiful bald cypress, sycamore, cottonwood, elm, and other trees line the lake and provide shade for recreationists as well as habitat for the wide variety of birds, squirrels, raccoons, and other wildlife residents. 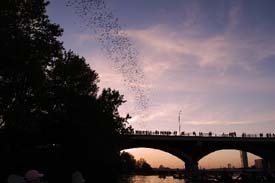 Paddle down to the Congress Avenue Bridge to witness the emergence of the largest urban Mexican Free-tailed Bat colony in North America. Watching the bats depart on summer evenings is an amazing sight as the 1.5 million bats fly off in search of their nightly meal of insects. Zilker Metropolitan Park is a recreational area in the heart of south Austin that comprises over 350 acres of publicly owned land. It is named after its benefactor Andrew Jackson Zilker, who donated the land to the city in 1917. The park serves as a hub for many recreational activities, including a playground, picnic areas, Barton Springs Pool and access to the hike and bike trail around Lady Bird Lake. Within Zilker Park lies one of the crown jewels of Austin, Barton Springs Pool. Three acres in size, the pool is fed from under ground springs and is on average 68 degrees year round. The Splash! exhibit offers a fun and exciting learning experience deep inside a simulated limestone cave. Multimedia displays and interactive exhibits demonstrate how the aquifer was formed and how it maintains its average daily flow of 32 million gallons of water at Barton Springs. Located on 30 acres in Austin, these gardens have often been called “the jewel in the heart of Austin”. Theme gardens, such as rose, herb and Japanese garden are interconnected with streams, waterfalls and Koi-filled ponds. The Hartman Prehistoric Garden recreates local dinosaur habitat. Located on the western edge of Zilker Park, the Austin Nature & Science Center is dedicated to the exploration of the natural world. Since 1960, ANSC has provided nature exhibits, education programs, and recreation resources for countless visitors, teachers, and children of all ages. When you come by for a visit you will be able to meet a coyote and red-tailed hawk, follow the path of Texas fossil hunters and un-cover evidence of pre-historic life, explore natural science specimens and add to your own collection. Come on by and help us celebrate the natural wonders of Austin! Red Bud Isle sits just south of Tom Miller Dam, where Lake Austin ends and Lady Bird Lake begins. The small island features a short hiking trail that circles the island and several spots along the way that extend right out to the water. 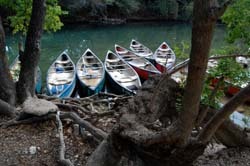 These small coves are ideal for fishing or taking the dog down for a dip in the water. The Mexican American Cultural Center is dedicated to the preservation, creation, presentation, and promotion of Mexican American cultural arts and heritage. The center is a tremendous resource for the community and visitors to learn and participate in classes and programs that will foster a meaningful understanding and appreciation of not only Mexican American but also Native American, Chicano, and other Latino cultures. The programs and educational curriculum include the areas of visual art, theater, dance, literature, music, multi-media and the culinary arts. This trail was made possible through a partnership with the Texas River School, Austin Parks and Recreation Department, Lower Colorado River Authority and Texas Parks and Wildlife Department.